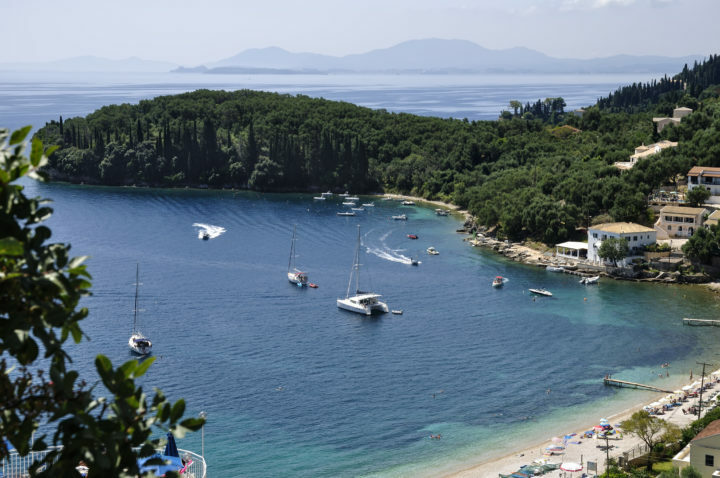 Kalami Beach is located 30 km from the main town of Corfu and 7 km from Kassiopi. You can get to Kalami Beach by rented car, taxi, or by bus. If you’re coming from the Corfu airport, a taxi ride will take about 50 minutes. If you prefer to take the bus from the airport to Kalami Beach, the bus station is about a 15 minute walk from the airport. From Kassiopi, the car or taxi ride only takes about 13 minutes. If you rent a car, be aware that parking around Kalami is limited. Kalami Beach has been awarded the Blue Flag, which means it meets high standards when it comes to cleanliness and organization. There are sun bedsand umbrellas available for rent to make your stay at the beach more comfortable. The beach is pebbly with white sand and the water is crystal clear. If you are planning to spend the day at Kalami Beach, you’re in luck as there is no shortage of amenities. The town of Kalami, as well as the beach, is a popular tourist spot. Kalami Beach is suitable for people of all ages and it’s family friendly. 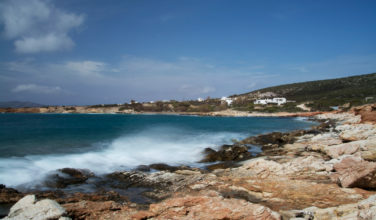 A fun fact about Kalami Beach is that it inspired English author Lawrence Durrell’s novel Prospero’s Cell. Durrell lived on Corfu Island and one of his houses, The White House, is still preserved today. 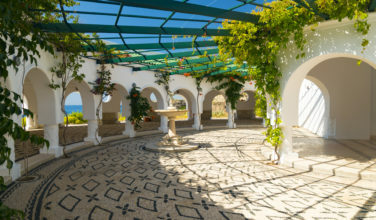 Durrell moved to Corfu in the 1930s, choosing a quiet and peaceful place to live. Kalami Beach has a number of water sports to take advantage of. You can go canoeing, water-skiing, or paddle-boating. You can hire a boat to take you around and enjoy the sights from the water. Swimming in the beautiful water is a good choice as well if you’d rather stay close to shore. When you get hungry, there are tavernas conveniently located on the beach. There are bars nearby too. If you want to wander from the beach for a while and explore what the surrounding area has to offer, you won’t be disappointed. Enjoy taking coastal walks during sunsets and you will no doubt catch some amazing photographs. There are isolated beaches to explore as well. 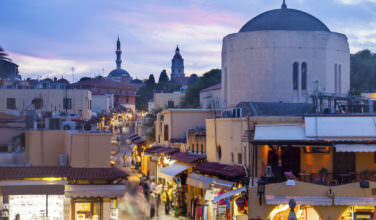 Walking around Kalami you will find supermarkets, gift shops, and Greek tavernas. You can visit Durrell’s White House at the end of Kalami Bay, which is open as a museum from time to time. You can experience the view he described in his novel and even sit on the sofa and chairs that he once sat. There are a couple of tourist offices where you can pick up a small guide for routes. You won’t be disappointed when you visit Kalami Beach on Corfu. Whether you’re looking for a relaxing day at the beach or water sports for adventure, you’ll find it here.